Rachna of Rachna Says fame is one of the finest bloggers I know. Her content is thought provoking and responsible and her writing always impeccable. Over the years I have come to admire her for not only her writing prowess but also the very principled and ethical manner in which she conducts herself in the blog world. She is also an extremely helpful and generous soul who will go out of her way to share her knowledge about blogging and blogs with her friends and even people she hardly knows. She is a genuine person, straight forward and honest. So I was in a quandary when she asked me to write a guest post for her. I wanted it to be something special, something that would appeal to her discerning taste. Then I remembered how much Rachna enjoys my posts on Japan and so I decided to do a ‘Japan and I’ post for her. I do hope my post has done justice to her fine blog! Japan has a unique culture, with its own peculiarities and quirks that seem natural to the Japanese but intrigue all foreigners. 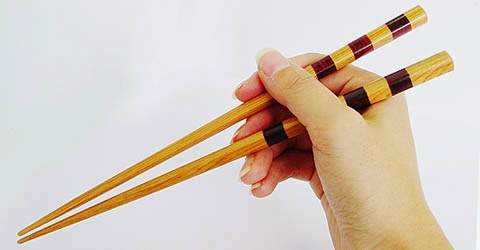 One of the most interesting and peculiar things about Japan is that while the rest of the world uses spoons and forks, the Japanese insist on eating their food with two pieces of wood! Please click on the following link to read the rest of the post on Rachna's Blog ! Entirely my pleasure Rachna ! Forget the blog.Every word you have said a bout Rachna is so correct.I have met her personally and she is an extremely nice person,extremely warm and hospitable.It was a pleasure meeting her. Thank you so much, Chowlaji, for your warm words and support always. Both Gurdev and I loved meeting you. loved it! keep writing more, Ruch.